The future prosperity of our community depends on our ability to create a better life for our children today. Across our region, 25,000 children reside with families who are unsure of where their next meal will come from. According to the US Census, more Americans were living in poverty in 2010 than at any time since the 1950's. When adults have a sustainable income they have the means to provide housing and basic needs for their family. Children have the security of a roof over their head and a greater chance to thrive through consistent attendance at school and access to community support systems. Today, too many low-income working families are struggling to make ends meet. United Way is committed to empowering families with the financial tools to succeed on their own. 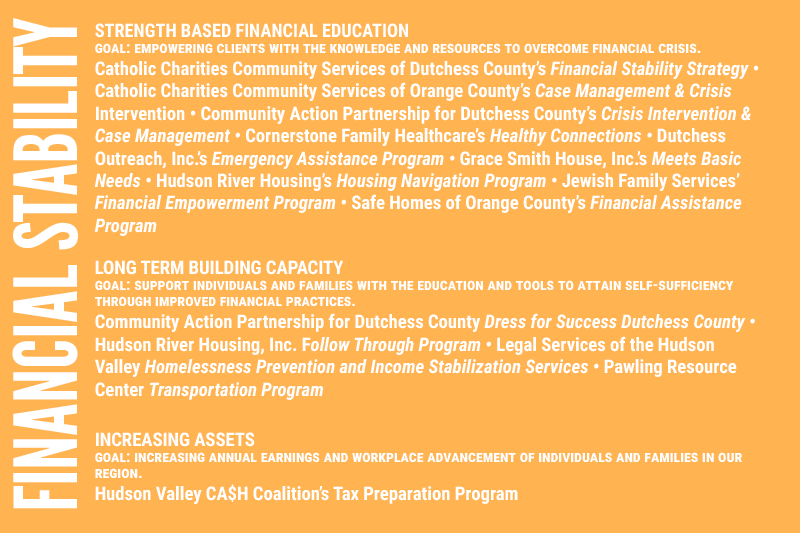 The goal of the United Way of the Dutchess-Orange region is to help individuals and families become financially stable and independent. Providing education to improve knowledge of financial literacy, reduce debt and increase savings. Connecting low to moderate income individuals with opportunities to increase annual income through tax programs and workplace advancement. Volunteers like you make United Way's tax assistance and financial education programs possible. We need your help, even if you don’t have an accounting background.